Yellow fever is a serious viral infection that’s spread by a type of daytime biting mosquito known as the Aedes Aegypti mosquito. It can be prevented with a vaccination. Since 1996, six travellers from Europe and North America have died from the infection. None of them were vaccinated. 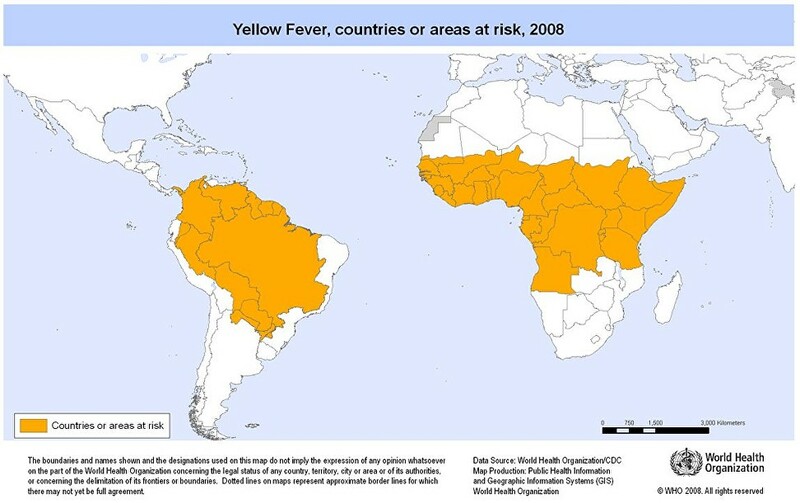 Yellow fever carries an 8% risk of death. It is called “yellow fever” because the infection targets the liver leading to jaundice – yellowing of the skin and the whites of the eyes caused by liver damage. There is a vaccination for yellow fever. 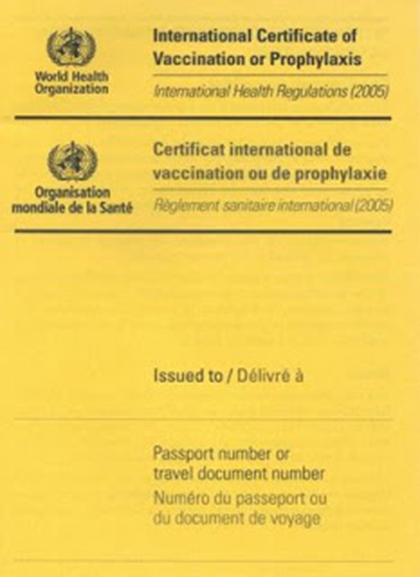 Some countries require proof of vaccination (a certificate) against yellow fever before they let you enter the country. You should have a yellow fever vaccination at least 10 days before your travel. This will allow enough time for your body to develop protection against the yellow fever infection.The yellow fever vaccination is recommended for anyone travelling to, or living in, areas or countries where yellow fever is a problem, and anyone travelling to a country where an International Certificate of Vaccination against yellow fever is required for entry. You can find a list of all the countries that require you to have an ICVP in the WHO International travel and health guide. You can also search the country information on NaTHNaC to find out whether the places you are visiting require an ICVP. If you have been travelling in an “at-risk” area during the past month, it is a good idea to carry your certificate with you. This will help avoid potential problems with immigration. It is possible for travellers without a valid yellow fever vaccination certificate to be vaccinated and held in isolation for up to 10 days. An ICVP is not required for entry into the UK. Yellow fever vaccine has never been available on the NHS service in the UK. It has always been a vaccine that has needed to be purchased privately. Prices for the vaccine vary widely across the UK, however at Regent Street Clinic we pride ourselves on offering the most competitive rates for all of our vaccinations and yellow fever vaccine currently costs £53 with the certificate. Babies under nine months of age. In cases where having a yellow fever vaccination is not advised, your GP may be able to issue you with an exemption letter. The letter should be written on headed notepaper and include the practice details. It may be accepted by some immigration authorities. If you are travelling from an area where there is a risk of yellow fever without a valid yellow fever certificate, immigration officials are legally entitled to quarantine you for a period of at least seven days at the point of arrival into a country. Reactions at the injection site usually occur one to five days after being vaccinated, although other side effects may last for up to two weeks. 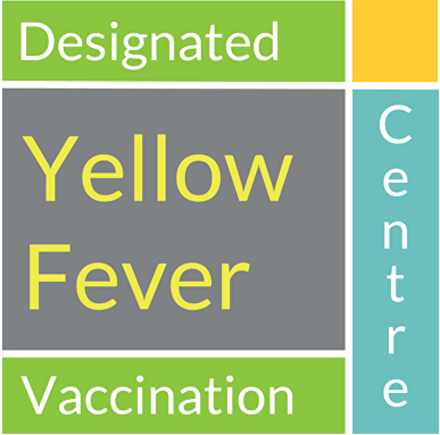 Rarely, the yellow fever vaccine is associated with a neurological condition known as yellow fever vaccine-associated neurological disease (YEL-AND). Neurological means that it affects the nervous system, including the brain and spinal cord. YEL-AND occurs in around four cases out of every million doses given. However, for people who are 60 years of age or over and yellow fever vaccine naïve, the incidence of YEL-AND increases by around five times, so in these cases the risk-benefit needs to be carefully assessed by the doctor or nurse.